The President is responsible to the Board of Governors for implementing the Vision, Mission and Strategic Plan, as well as the day-to-day operation and all policies, issues and decisions pertaining to the administration of the Institute. He is supported in this role by the Executive Team. Michel Tarko was first appointed by the JIBC Board of Governors as President and CEO in October 2012 for a five-year term and was reappointed to a second five-year term in July 2017. Prior to that, he served as JIBC Vice President, Academic since September 2009 and as Associate Dean and Dean for the Faculty of Health Sciences at Douglas College from 2005 to 2009. Prior to these roles in academic leadership, he served as a faculty member in the Department of Psychiatric Nursing, Faculty of Health Sciences at Douglas from 1988 to 2005. In his role as VP, Academic at JIBC, he led the approval of the Diploma in Health Sciences (Emergency Medical Services); the Bachelor of Law Enforcement Studies degree, and graduate certificates in: (1) Complex Trauma & Sexual Abuse; (2) Dynamics of Conflict; and (3) Intelligence Analysis & Tactical Crime Analysis. As President and CEO, Michel has led the development of the new JIBC 2015-2020 Strategic Plan with the JIBC Board of Governors, and partnership development between JIBC and other public post-secondary educational institutions in B.C., across Canada and internationally, creating pathways for student and faculty exchanges, and applied research initiatives in the context of public and community safety. He is also continuing to build relationships and partnerships with business and industry where JIBC can be a solution to priority issues related to community and public safety training, education and applied research. Michel served as a member and vice-chair of the Board of Directors for the Post-Secondary Employers Association (PSEA, 2014-2016), and serves on the Board of Directors for Colleges and Institutes Canada (CICan), the national association representing Canada’s public community colleges, institutes, cegeps and polytechnic teaching universities, representing the British Columbia Association of Institutes and Universities (BCAIU). Michel earned his Doctor of Philosophy degree (PhD) in Education (Curriculum & Instruction) from the University of British Columbia and holds a Bachelor of Arts degree in Criminology from the University of Manitoba, as well as a Diploma in Psychiatric Nursing from the Manitoba School for Psychiatric Nursing. Colleen is passionate about excellence in training and education informed by applied research to keep our communities safe. She served as JIBC’s Dean, School of Public Safety for four years and for seven months also filled the role of Interim, Vice-President, Academic. She was appointed Vice-President, Academic in January 2017. Colleen’s career started with the BC Corrections Branch and she was hired by JIBC as an instructor for the Corrections & Community Justice Division in 1991. Her time with JIBC has included positions as a program manager, program director, and director in the Emergency Management Division. In October 2013, she was appointed Dean, School of Public Safety with oversight for the Emergency Management Division, Fire & Safety Division and the Driver Education Centre. She has a Diploma in Criminology from Douglas College, a Bachelor of Commerce and Master of Education degree from the University of British Columbia. She has served on numerous boards and committees locally, provincially and nationally. In addition to her educational role, Colleen has been involved in emergency and disaster responses throughout British Columbia and the state of Georgia. She has been honoured as JIBC Instructor of the Year, and she received a NISOD Excellence Award for teaching from the University of Texas. Kayoko finds great joy in working at JIBC, noting that the level of passion people hold here is just phenomenal. Her goals include further shaping organizational sustainability and leveraging opportunities for greater collaboration and increased coordination internally. Kayoko joined JIBC in 2005 and became Director, Finance & Administration in 2006. She was appointed Vice-President, Finance & Operations in March 2017. Prior to that, she held leadership roles including controllership and operations management positions in the education, software, manufacturing, retail and wholesale sectors. All of her industry experience included work in companies with international presence. She holds a Bachelor of Business Administration (double concentration in accounting and management of information systems) from Simon Fraser University (SFU), a Chartered Professional Accountant (CPA, CMA) designation, and an Executive Master of Business Administration from SFU. In addition to her accounting and management roles she has co-facilitated and trained over three cohorts of candidates through the CMA Strategic Leadership Program. Her volunteer work includes a combined 10 years of adjudicating CMA and CPA candidates in their Capstone I/Strategic Case presentations. She has also sat as a panel judge on the UBC Sauder School of Business undergraduate business case competitions. She currently belongs to the Government Organizations Accounting and Auditing Forum as one of the representatives from the B.C. post-secondary sector. Jon believes that creating and maintaining a work environment which enables JIBC to attract and retain the best people is key to the achievement of the Institute's vision. Prior to joining JIBC, Jon held a variety of human resource positions including Manager, Training & Development at Westinghouse; Manager, Labour Relations at CIBC; and Western Regional HR Manager at DHL Express. After obtaining his honours BA and Bachelor of Education from York University in Toronto, Jon began his career as a high school English and Drama teacher in Toronto. He then transitioned his teaching experience into a position in human resources as a Facilitator with Travelers Canada Insurance. Janet Haberfield - Executive Assistant to the Office of the President and the JIBC Board of Governors. The Senior Management Council (SMC) advises the President and CEO, who is responsible to the Board of Governors for the leadership of the Institute, and the Vice Presidents on education, leadership, and administrative topics in support of JIBC’s Strategic and Education Plans. Additionally, the Council explores opportunities and issues, examines implications across Schools, Divisions, Centers, Academies and Offices, and initiates action on matters as required. As Dean, Dr. Greg Anderson is focused on helping JIBC advance justice and public safety through applied research. He draws on experience in research, curriculum design, project management and university governance. 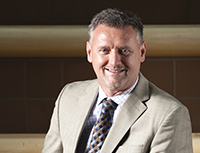 Greg joined JIBC from University of the Fraser Valley (UFV), where his roles included Chair of the Kinesiology and Physical Education Department, Manager of the Mission Campus, Chair of the Education Council, and Board of Governors member. His varied research interests include exercise and occupational physiology, and his work has been published in both pure science and practitioner journals. As a presenter at regional, national and international venues, Greg helps practitioners understand the fundamental theory behind popular practice. As a practitioner, he has worked with physically demanding occupations (primarily police), and provincial and national athletes (most recently with the National Women’s Soccer team). He received the Canadian Society for Exercise Physiology (CSEP) Health and Fitness Program Recognition Award in 2003, for his contributions to the health and fitness field both provincially and nationally. More recently, he received the CSEP Health and Fitness Program of British Columbia Service Award. At UFV, he received an Outstanding Initiatives Award as well as a Teaching Excellence Award. He earned a PhD in kinesiology (applied physiology) from Simon Fraser University, and received a BPE and MPE in exercise science from the University of British Columbia. Stuart joined JIBC in 2008 as a credentialing specialist. His previous position was Associate Dean, Centre for Graduate Studies & Academic Planning. He was also the Chair of the Graduate Certificates in Intelligence Analysis and Tactical Criminal Analysis. Prior to joining JIBC, Stuart worked in international educational programming at the post-secondary level for eight years, followed by 10 years as a university professor in Japan where he also served on an international relations committee which included attending conferences in Southeast Asia. Stuart holds a doctorate in teacher education from Nottingham University, a Masters of Education in curriculum and instruction from the University of British Columbia, and a Bachelor of Arts in classical studies from the University of Victoria. With more than thirty years of experience as an educator and administrator, Barb brings a passion for innovative teaching and learning, and quality curriculum and instructional design as Dean of the School of Health, Community & Social Justice. Prior to joining JIBC in 2005, Barb worked with the provincial government for more than 10 years managing the development and delivery of fire and life safety education training for the BC Office of the Fire Commissioner. She began her career in education as a teacher and counsellor within the B.C. secondary school system and holds a Master of Education Degree (Curriculum & Instruction) from the University of Victoria and a Bachelor of Physical Education from the University of Calgary. Sarah previously served as the Acting Director of the Emergency Management Division (EMD). She joined JIBC in 2006 as the coordinator/instructor for Emergency Social Services training in EMD, where she was responsible for developing curriculum and delivering training to the volunteers and staff in communities around the province who provide aid to individuals and families forced to evacuate from their homes. In 2009, she switched her focus to one of JIBC’s degree programs. As program manager, she was responsible for the implementation of the Bachelor of Emergency Management Studies program. In 2013 the breadth of her responsibilities increased, and as program director in EMD, she assumed overall responsibility for all the division’s credentialed programs and program and curriculum development activity. In addition, she has served on numerous Institute-wide committees, including Program Council and Program Council Curriculum Committee. Sarah has a Bachelor of Arts from Simon Fraser University and a Master’s of Education from the University of British Columbia. Prior to joining JIBC, Dr. Ruttan worked in international educational programming at the post-secondary level for eight years, followed by 10 years as a university professor in Japan where he also served on an international relations committee which included attending conferences in Southeast Asia. Ruttan holds a doctorate in teacher education from Nottingham University, a Masters of Education in curriculum and instruction from the University of British Columbia, and a Bachelor of Arts in classical studies from the University of Victoria.